If you’re thinking about renting your home as a vacation rental, Coastal Waves Vacations is here to help! Coastal Waves Vacations is not just another property management company, and your home is not just another property ID. We want to partner with great homeowners, who care about their properties and the experience guests have at your property. Our company began when our owner decided to rent out her own home as a vacation rental, but was not able to find a company on the island that she felt was hands-on & that she’d entrust to take care of her own home as it were theirs. We understand what it’s like to be on the owner’s side of the business, as well as the property manager’s side and even the guest. We take care of our rentals with the same care and involvement as if they were our own homes. Coastal Waves Vacations is a full-service property management company; priding ourselves on professionalism, integrity, accountability, and quality housekeeping, maintenance, and customer service while maintaining your property at the highest standards possible. We want to meet and exceed your goals, as well as make sure your home stays in the best possible condition and continues to look great year after year. We do this by being very hands on and safeguarding your investment by completing regular inspections between every reservation in order to prevent, rather than fix issues that may arise. We have a stringent selection process for all suppliers, service providers, and our office staff. Together, we share similar goals and are vested in your home and our business relationship. Coastal Waves Vacations takes care of advertising your home, having professional photos taken, writing up your property description, managing reservations, schedules maintenance repairs, cleaning, inspections, ensures guest satisfaction, takes after-hours emergency calls, handles reservation inquires around the clock and on weekends to inquiries so you never miss a reservation just because our office was closed. Coastal Waves Vacations even handles all the accounting; pays state sales tax, local occupancy tax, prepares your 1099, and pays out any bills you may have incurred from your escrow account. Property management is pretty tough work, but we have seen it all, been through it all, and have it down to a science! There are a lot of things that go into making sure your rental is ready and things go smoothly. 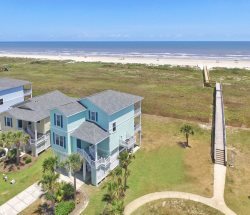 With lots of experience, we have learned what works and what doesn’t when it comes to managing vacation rental homes on Galveston Island. We understand how valuable your time, money and most importantly, peace of mind is when it comes to finding the right company to manage your investment. Please contact Coastal Waves Vacations today to get a personalized rental projection of what your property could earn and to answer any questions you may have! Facilitate routine home maintenance with the vendor or your choice; HVAC, cable, lawn service, etc. Always expanding - check back soon for additional updates!